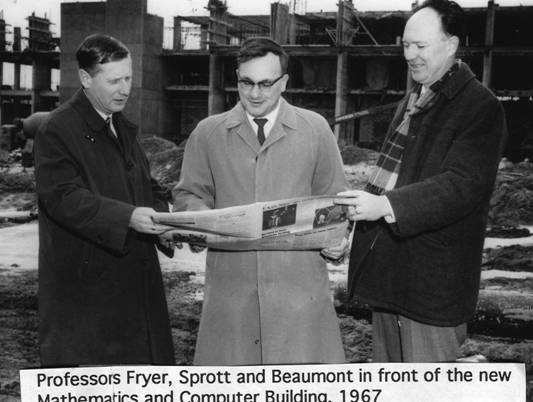 Mathematics became a separate faculty on 1 January 1967, with David Sprott as the first Dean of Mathematics. The UW Faculty of Mathematics was the first of its kind in North America and perhaps throughout the world. The new building in the background is the "Mathematics and Computer Building". UW acquired the IBM 360/75 to supplement the 7040 and 1401. The 360 was twenty times faster than the 7040 and 1401 computers. This was Waterloo's most successful compiler. It was first known as WATFOR and later as WATFIV when FORTRAN language extensions presented at a SHARE conference were added to the program. The acronym WATFIV literally stands for "Waterloo (WAT) FORTRAN (F) 4 (IV)." 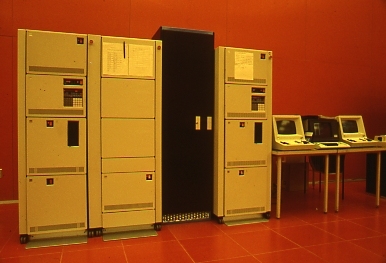 WATFOR 360 was developed in 1967 and it greatly enhanced the speed and ease of use of the IBM 360 series of computers. 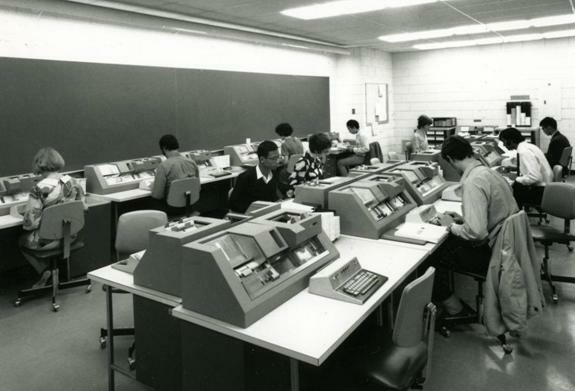 The program was essentially WATFOR for the IBM 360 series, the latest in computing technology at the time. It was also the early student-friendly variant of FORTRAN IV. The group leaders of the team that created the compiler, Paul Dirksen and Paul Cress, won the Grace Murray Hopper Award in 1972 for their efforts. In 1973, WATFIV was augmented with structured programming constructs and character variables to create WATFIV/S (Cowan, Graham, Mackie 28). Paul Dirksen was one of two project leaders in charge of writing the WATFOR 360 program. Here, Dirksen is photographed by PC magazine in 1985. At the time, Dirksen was the Director of Computer Services at UW. For full the article, please see: UW Special Collections. GA 133-57. Wes Graham Fonds. Series 1.2: Biographical: Articles. John Helliwell, PC 4, no. 7 (April 2, 1985), 204-209, ill. When Cress and Dirksen completed their work on the WATFOR 360 compiler, the program increased the performance of the machine to the point where it could compile and execute a 45 card job in under 10 seconds. Comparable programs took some 13 minutes to execute the same job. The WATFOR 360 compiler became the basis for the world-famous WATFIV program, however, as Bruce Uttley, a Senior Technologist with IST (Information Systems Technology) cautions, the WATFIV compiler came about later, when language extensions presented at a SHARE conference had been added to WATFOR 360. The evolution of computer programs is often a transition and is dependent on the interconnectedness of Waterloo with other universities and companies worldwide. At the same time, the Waterloo name became ubiquitous. A computer generated report on a simple job run by the WATFOR 360 compiler. 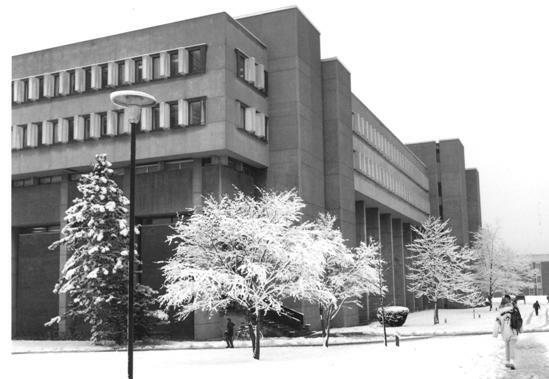 Despite the widespread demand for the services it provided, the Computing Centre had its budget cut, a sign of difficult times and the need to create an awareness of the importance of computing for UW at a time when UW had nine construction projects underway, including the new Mathematics and Computer building. 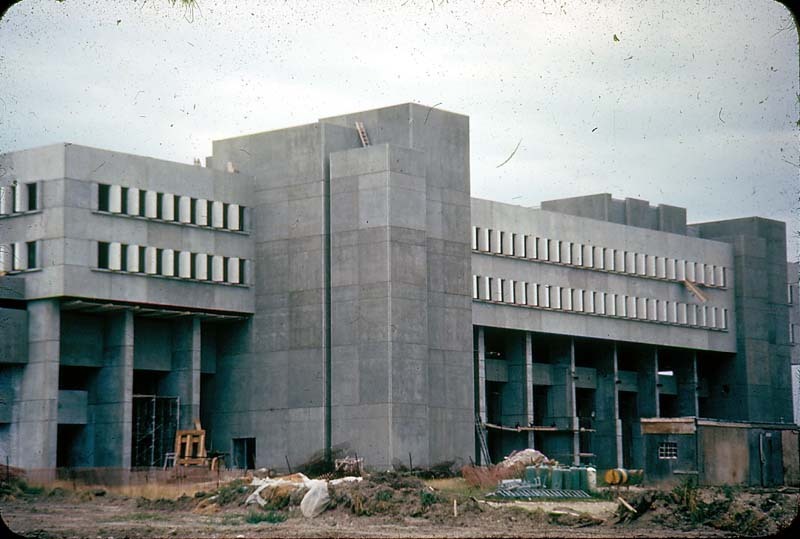 The Mathematics and Computer BUilding under construction in 1966. 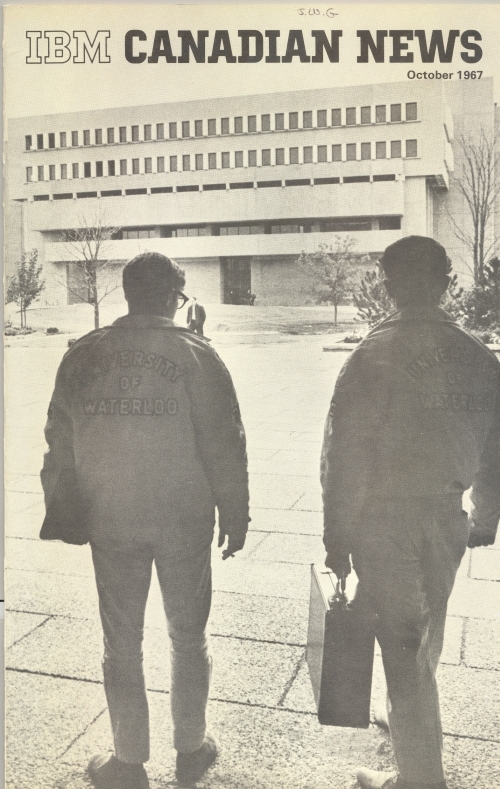 IBM regularly featured the University of Waterloo and Waterloo students in its trade publications. 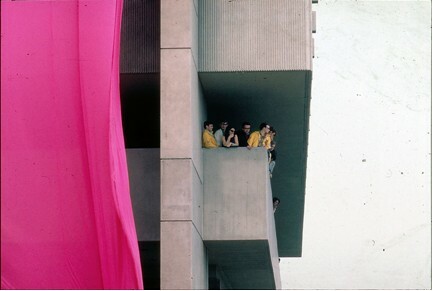 At the ceremony in 1967 when the Mathematics and Computer building was unofficially opened, the new building was decorated with an enlarged replica of one of Ralph Stanton's favourite ties. This tradition of hanging a pink tie on the building has been an enduring legacy. The building was officially opened in May, 1968. 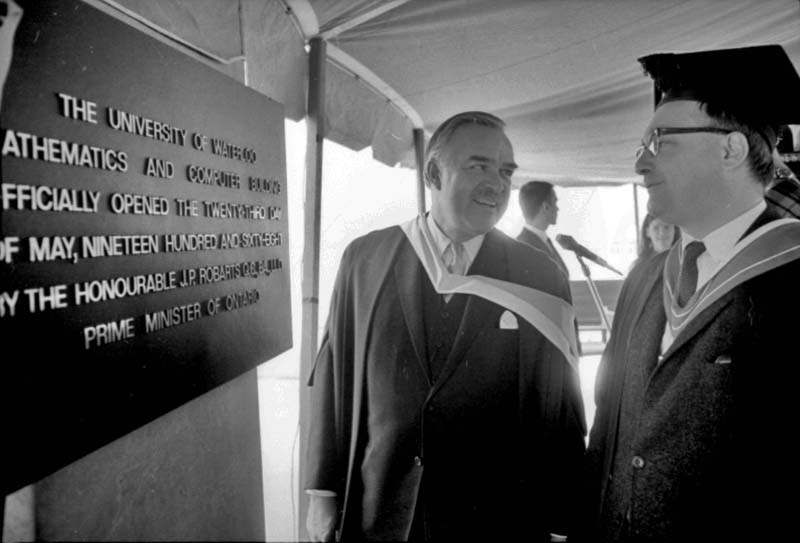 Prime Minister of Ontario John Robarts and Dean David Sprott at the opening of the Mathematics and Computer Building. UW Special Collection, 68-1466-2. Opening Gala. UW Special Collection, 68-1466-4. Prime Minister John Robarts and Dean David Sprott touring the new facilites. 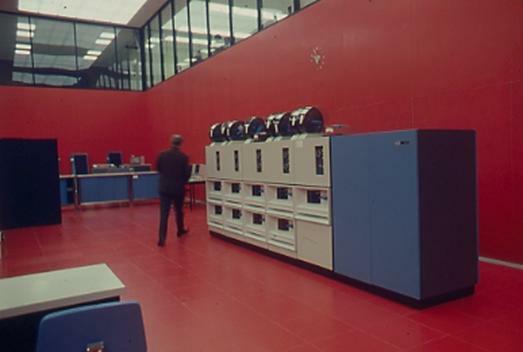 In 1967, the Computing Centre had moved its formidable array of equipment into the Mathematics and Computer building. 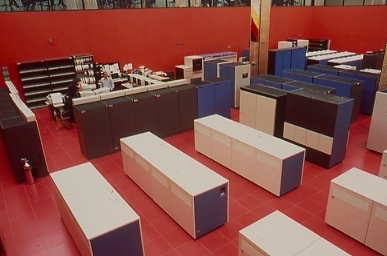 The department had four computers to relocate and some of them were quite massive: the IBM 1620, 1710 and 360/75. 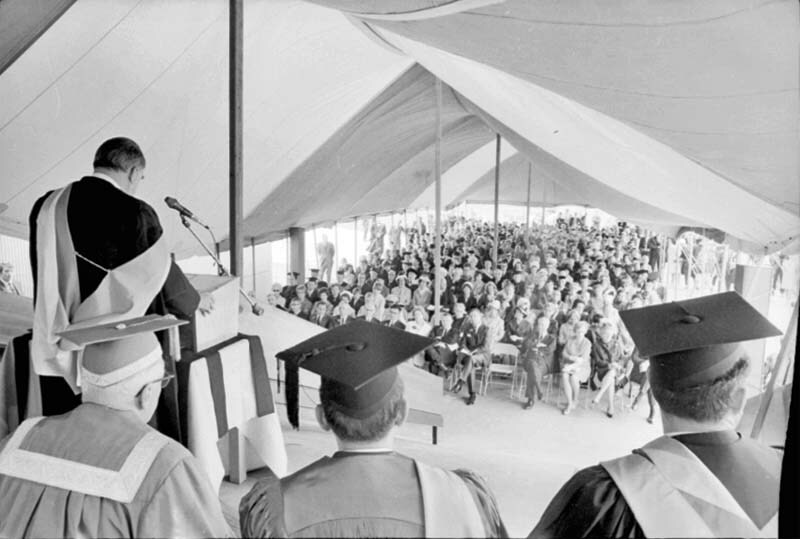 It was not until1968, however, that the faculty members of the department were able to take up their offices in the new building. 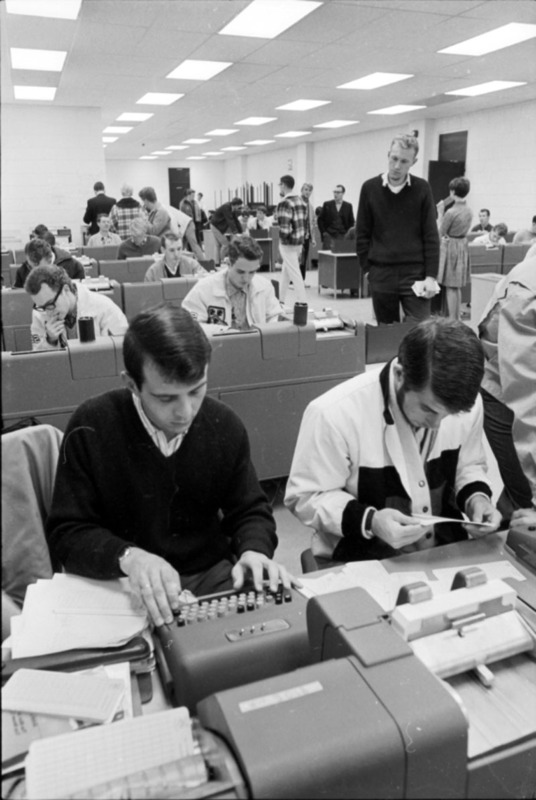 Students operating IBM 029 keypunches in the keypunch room of the Mathematics and Computer Building during the '67-'68 school year. The newer 029 keypunches were used by graduate students while undergraduates were limited to using the older 026 keypunch terminals. Photo courtesy of UW Special Collections/Don Cowan. On its unveiling, The Red Room, located in the centre of the new Mathematics and Computer Building, quickly became both a UW icon and an attraction that brought countless visitors and students to the University of Waterloo. The choice of the red colour is part of Waterloo folklore and the stuff of legends. 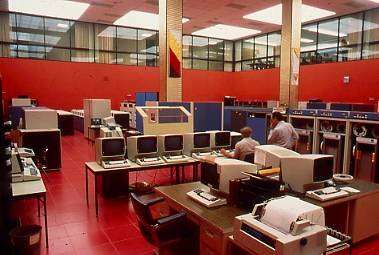 Photo: "the Red Room" with the IBM 360/75. In the photograph is the 2314 disk drive unit. The IBM 360/75 and 7040/ 1401 were equipped with a plotter that could produce and print simple shapes and basic diagrams. 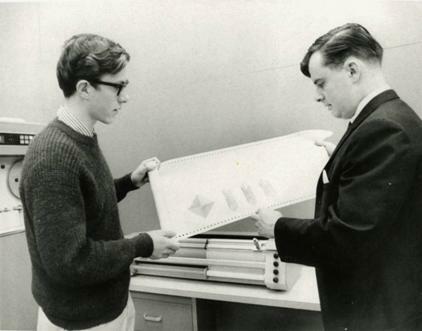 Here Gus German (right), a computer analyst with the Computing Centre, and a student display a printout produced by the machine. 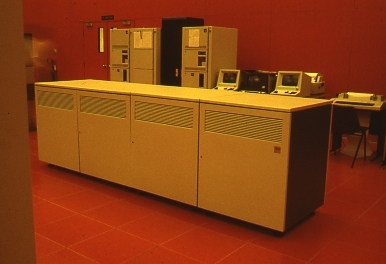 On 1 July 1967, German assumed responsibility for the University's Calcomp 763/770 Plotting System which had been purchased in the summer of 1967. Photo courtesy of UW Special Collections/Don Cowan. Bob Cressman working on main console of the IBM 360/75. UW Archives/Don Cowan—6 April 1971. In 1967, the Combinatorics and Optimization Department of the Mathematics Faculty was approved by the Board of Governors. Along with the nascent department of Computer Science, this new department would shape the international reputation of the university. For the 1967-68 academic year Mathematics had an enrolment of 1,430. Of those students, 130 were doing graduate work and 600 were in Co-op. The rest of the students were regular undergraduates There were now more than 150 companies involved with Co-op. Professor John Brzozowski, formerly of the University of Ottawa, joined UW. Brzozowski's arrival signalled the development of the theoretical orientation in C.S., which would be an important complement to the existing renown in computing applications for which Waterloo had become known worldwide. Wes Graham travelled through South America in 1966 at the request, and expense of IBM. The trip allowed Graham the opportunity to discuss UW's programs with other university leaders. At this time, Graham established "the Brazil connection" with professors from the Catholic University of Rio de Janeiro Brazil, a relationship that continues to the present. 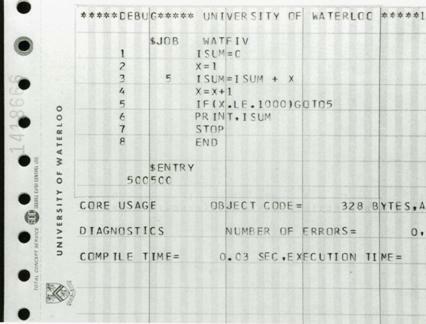 In response to the rapid growth of computing among students at Waterloo, the TRACE program was developed in 1967 by Rod Milne to provide better debugging facilities for machine and assembly language programs (Cowan, Graham, Mackie 28). 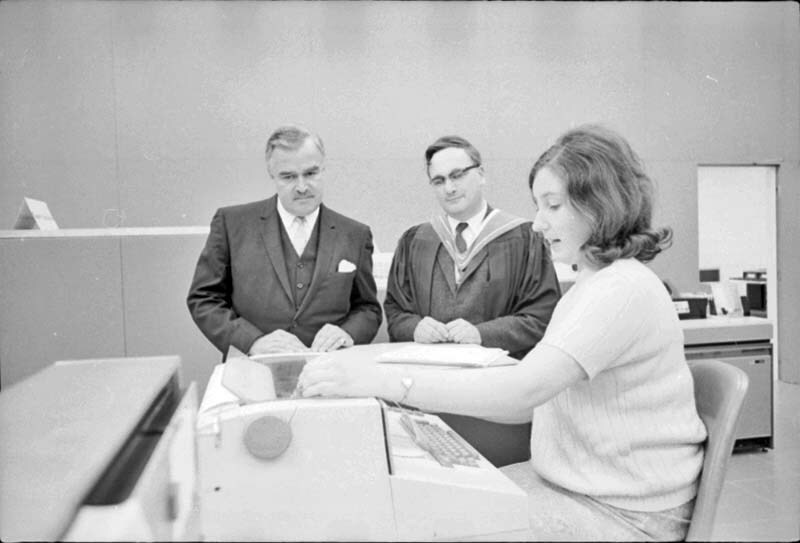 The November 1, 1967 issue of the Computing Centre Newsletter announced that the centre would provide automated marking of multiple choice tests and exams for professors. The forms that allowed for this process were quite limited in that tests could only be 52 or 80 questions long. Only student numbers, but no student names, could appear on the test paper. UW Special Collections. GA 133-944. Wes Graham Fonds. Series 4.1: UW Files to 1973. "Machine Processing Of Multiple-Choice Examinations." Computer Centre Newsletter (Issue 9, November 1, 1967), 8-9.